3"/50 (7.62 cm) Mark 33 at Confederate Air Force Museum, Mesa, AZ. Photograph copyrighted by Vladimir Yakubov. In 1944-1945, the USN found that their 20 mm Oerlikons and 40 mm Bofors batteries were ineffective in stopping Japanese Kamikaze attacks. Only the 5"/38 (12.7 cm) fired a round large enough to kill-stop a determined attacker and this weapon was too heavy to use in the numbers necessary. This problem led to an accelerated program to develop an intermediate-caliber weapon that could fire a VT fuzed shell. The weapon chosen was the standard 3"/50 (7.62 cm) Mark 22 which was used on many Destroyer Escorts and auxiliaries built during the latter part of World War II. This was the smallest-caliber weapon which could still use the VT fuzes available at the time. It also had a concentric counter-recoil spring, which meant that it was more easily adapted for automatic fire. Automatic fire was achieved with an electrically driven auto-loader using revolving sprockets. BuOrd rushed this through the design phase, with the first prototype being ready for test firing on 1 September 1945. The end of the war slowed development and resources were diverted to the more potent 3"/70 (7.62 cm) design. 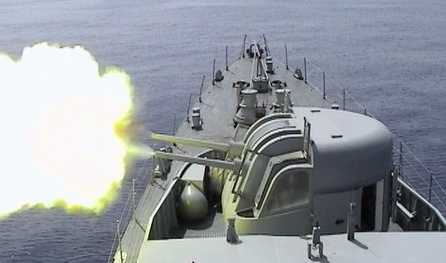 As a result, it was not until 1948 that this weapon was delivered to the fleet in quantity. Although completed too late for service during World War II, this weapon was widely used on many USA ships from the late 1940s through to the 1980s and remains in service today (2009) on a few USA ships sold to other nations and on the Norwegian Oslo Class frigates. The Spanish firm of Fabrica de Artilleria, Sociedad Española de Construccion Naval manufactured these guns under license for the Spanish Navy. HMS Victorious was given six twin mounts following her reconstruction during the early 1950s. Dimensionally, the new twin 3"/50 (7.62 cm) mounting was the same size as the quad 40 mm Bofors mounting, although it weighed a bit more. The additional weight meant that these guns replaced the Bofors guns on a one for three basis, rather than the originally intended one for two basis. Ammunition was loaded from each side into the auto-loader. The sprockets turned intermittently, transporting the rounds to a loading tray, which swung down to be in line with the breech where a rammer then catapulted the rounds directly into the firing-chamber, with the breech-closing mechanism being triggered by the edge of the cartridge case as it tripped one of the ejectors. 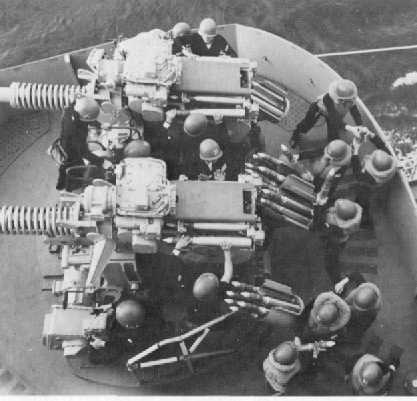 Effectively, the auto-loader simply replaced the crewmen whose job it was to push shells into the breech. The auto-loader is synchronized with the rhythm of the recoil motion, so that new rounds are ready to be rammed at the instant that the previous cartridge is ejected. Ballistically, the new automatic weapon had the same characteristics as the older weapon, although the higher rate of fire did result in a shorter barrel life. 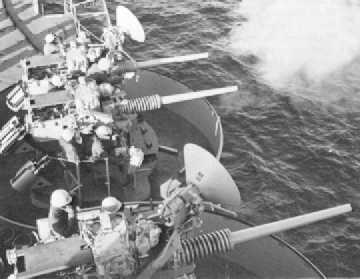 It is possible that these guns on USS Biddle (DLG-34) damaged a Mig fighter in the Tonkin Gulf on 19 July 1972. Constructed with an autofretted monobloc barrel with chromium plating and secured at the breech by a bayonet joint. Uses an automatic breech block. The mechanical and electrical complexity of this weapon were near the limits of World War II technology and excellent servicing is required to keep it in operation. However, it did give greatly improved performance against likely aircraft targets, with testing showing that against a target representing a Nakajima plane a single rapid-fire 3"/50 (7.62 cm) was as effective as two 40 mm quad mountings and that it could effectively engage at a much longer range. As per the nomenclature change in the US Navy after World War II, these weapon designations are for the mountings, not the gun itself. The gun barrel was the Mark 22 first produced during World War II. Mark 27 was the original twin mount, Mark 33 was an improved twin mount with a different slide and Mark 34 was the single mount version. As of 2001, munitions were being produced by Simmel Difesa (Italy), Nammo Raufoss (Norway) and EXPA (Spain). The ASP M79 is an anti-ship projectile manufactured in Norway by Nammo Raufoss. The fuze on this projectile is designed to detonate about 6 to 13 feet (2 to 4 m) after penetration. ^Some SPD and SPDN cartridges had flashless pellets added which gave them a "reduced" flash. The automatic versions of this weapon had about half the barrel life as did the semi-automatic versions because of the higher ROF. 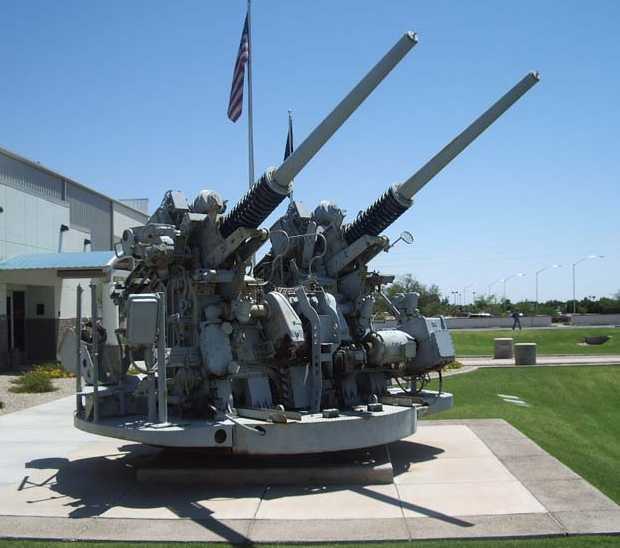 Since neither the mounting installation nor the associated fire control system for these guns include a provision for fuze-setting, only VT-fuzed projectiles were used for AA fire. Base-fuzed and point-detonating-fuzed projectiles for surface fire were also available. An AP round was developed in the 1950s. HC Mark 27 and AA Mark 27 were the same projectiles but assembled with different fuzes. These 3" (7.62 cm) HC rounds were unique in that they were the only ones of that type issued by the USN that did not have a base fuze in addition to a nose fuze. Time of flight to 6,000 yards (5,500 m) was 12 seconds for a +5 degree elevation. ^Normal crew for the twin 3"/50 (7.62 cm) was eleven men, including a mount captain, two control station men, four shellmen and four shell passers. For local control an additional sight setter was required. On the twin mounts, the gun-layer on the right side controlled the mounting for surface fire while the left gun-layer controlled the mounting for anti-aircraft fire. The mount captain stood between the guns. ^Some later Mark 33 mountings on smaller ships included an aluminum and fiberglass weather shield. Twin 3"/50 (7.62 cm) Mark 33 Mount Note that the guns loaded from both sides and the revolving magazines. USS Canberra CAG-2 in 1964. Twin 3"/50 (7.62 cm) Mark 33 Mounts. The Radar antennas are for the Mark 63 Director. 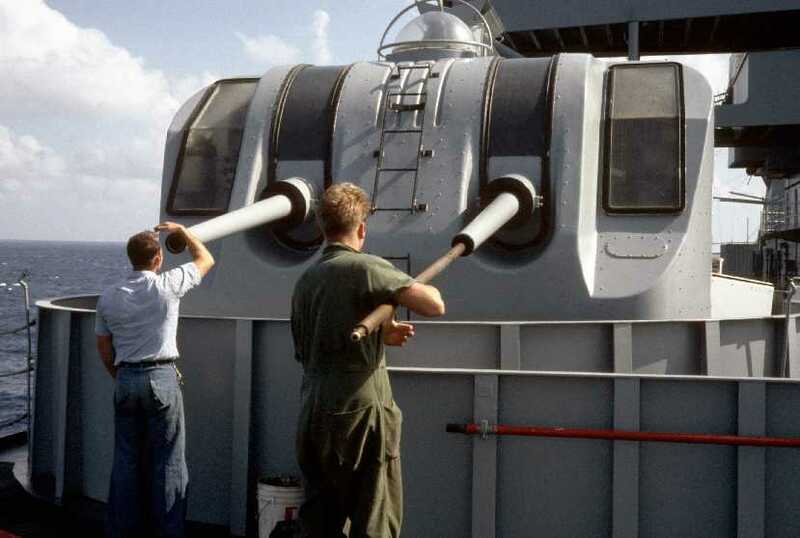 Cleaning the gun barrels aboard USS Pyro AE-24 in November 1986. U.S. Navy Photograph No. DN-ST-87-02706. 3"/50 (7.62 cm) on Norwegian KNM Narvik. Photograph courtesy of KNM Narvik. 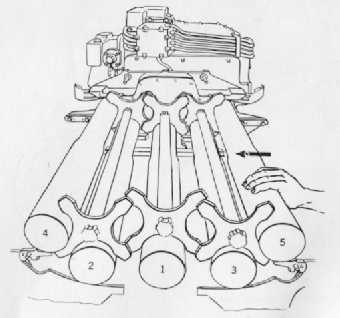 Detail of the five rounds in the auto-loader. The numbers represent the order in which the rounds are fed into the loading tray.